Online Retailer, Spring, Opens Its Virtual Doors to Plus Size Fashion! Online mega retailer, Spring has launched into plus sizes, providing the plus size woman a place where she can shop over 30 plus size brands w/her friends. Have y’all heard of Spring? No, not the blossoming season, but the online store offering over 1,500 mainstream brands across fashion, beauty, lifestyle, and home. From fast-fashion to luxury labels, it’s basically a one-stop shop! Also, we just learned Spring was a maverick to the online retail game as it was the first marketplace to offer free shipping and free returns. Wow! The online shopping site recently launched an ample amount of stylish plus size brands such as ELOQUII, IGIGI, Slink Jeans, Hips and Curves, Universal Standard and Sealed With A Kiss, all of which we’ve featured here before! The retailer enhanced its app and website so that its extended size customers — plus size and petites — have a more personalized shopping experience, equipped with special designated landing pages. Filters include limiting results to sizes 18-26 and 1X-3X. 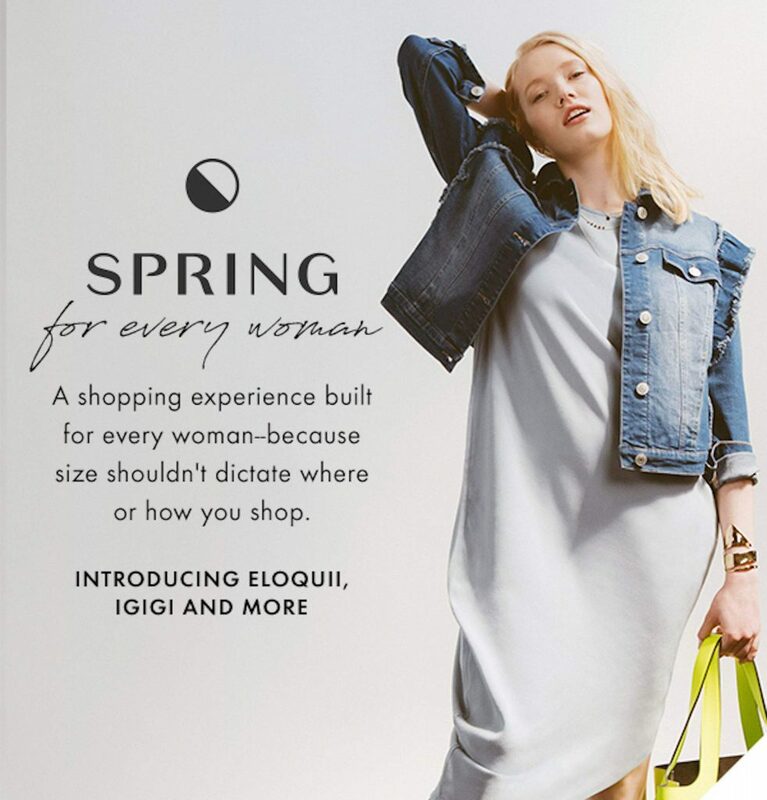 “Spring is committed to an inclusive shopping experience, offering the largest catalog of products, unparalleled value, and world class customer service for all customers,” said Katherine Prime, Spring’s Chief Customer Officer. Along with the above-named brands, Spring hopes to launch over 20 size inclusive brands in 2018. Right now there are already 30 brands with plus size options such as BB Dakota, Rachel Roy, and Violeta by MANGO. With such significant news, we gotta have beautiful models to showcase the new looks, right? Well, Spring’s new editorial campaign stars Betsy Teske, the first curvy model to walk for Alexander McQueen at Paris Fashion Week and America’s Next Top Model runner up and body positive activist, Khrystana! “Shopping on Spring is just pure joy. I love that curvy women can actually wear what they see in the campaign and feel fashionable,” exclaimed Khrystana. This sounds promising and we can’t wait to see the rollout of more size inclusive brands! On the heels of CoEdition, news of Nordstrom extending sizes, and Target making a stance to deliver more in store plus size fashion, is the tide changing? This should be interesting to watch! Browse Spring’s Plus Size Options at shopspring.com! What do y’all think about this online retailer after learning about it? Curious? Were you familiar with it before? Do you plan to use this service for an easier experience? Let’s talk online shopping in the comments!